This is a book guaranteed to delight the reader. It not only depicts the state of mathematics at the end of the century, but is also full of remarkable insights into its future de- velopment as we enter a new millennium. True to its title, the book extends beyond the spectrum of mathematics to in- clude contributions from other related sciences. You will enjoy reading the many stimulating contributions and gain insights into the astounding progress of mathematics and the perspectives for its future. One of the editors, Björn Eng- quist, is a world-renowned researcher in computational sci- ence and engineering. The second editor, Wilfried Schmid, is a distinguished mathematician at Harvard University. Likewi- se the authors are all foremost mathematicians and scien- tists, and their biographies and photographs appear at the end of the book. 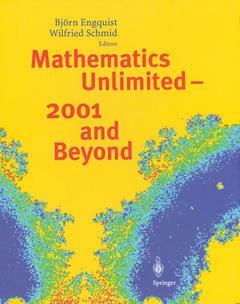 Unique in both form and content, this is a "must-read" for every mathematician and scientist and, in particular, for graduates still choosing their specialty. II.- Evolution Equations in Geometry.- Computational Field Visualization.- Whither Applied Nonlinear Dynamics?.- Mathematics Comes from Many Sources….- The Ubiquitous Heat Kernel.- Mathematical Modelling of the Internet.- Developments in Insurance Mathematics.- Discontinuous Groups for Non-Riemannian Homogeneous Spaces.- Cryptography.- Periods.- How Should We Prepare the Students of Science and Technology for a Life in the Computer Age?.- Astrophysics and Cosmology in the 21st Century.- L2-Invariants and Their Applications to Geometry, Group Theory and Spectral Theory.- A Chapter in Physical Mathematics: Theory of Knots in the Sciences.- The Unity of Mathematics.- Geometric Aspects of Mirror Symmetry.- What Is an Algorithm?.- From Number Crunching to Virtual Reality: Mathematics, Physics and Computation.- Modeling the Cardiovascular System: A Mathematical Challenge.- Math in the Entertainment Industry.- Three Problems in Real Algebraic Geometry and Their Descendants.- Primitive Automorphic Forms.- Mathematical Challenges from Molecular Evolution.- Mathematical Methods in Medical Imaging: Analysis of Vascular Structures for Liver Surgery Planning.- Systems of Conservation Laws: A Challenge for the XXIst Century.- RIMS for the 21st Century.- Discrete Probability.- Probability Theory — A Somewhat Narrow Perspective.- Error-Correcting Codes and Curves over Finite Fields.- The Turing Machine Paradigm in Contemporary Computing.- Randomization of Algebra and Algebraization of Probability — An Attempt at Prediction.- Dynamical Systems: Moving into the Next Century.- Noise in the Climate System — Ubiquitous, Constitutive and Concealing.- Questions About Polytopes.- Biographies.